Huge waves greeted the ship in Savu, our first expedition stop in the Spice Islands. 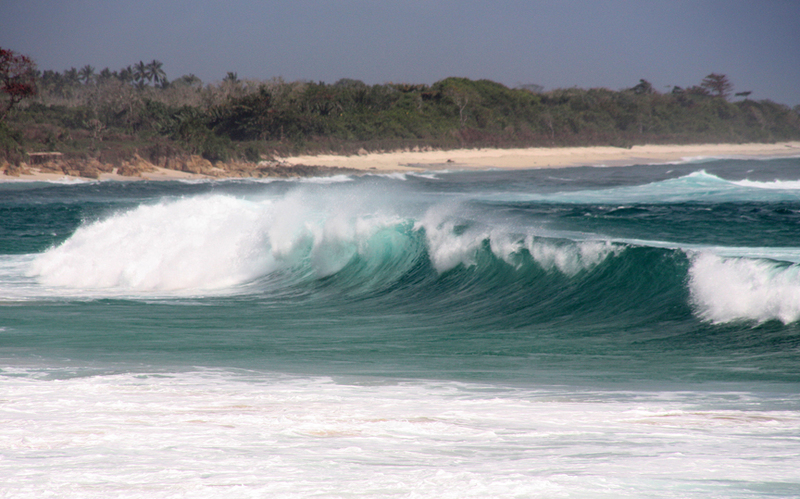 A southerly swell made Zodiac landings on the beach impossible in parts of the Spice Islands. Unable to land Zodiacs ashore, we came in alongside the busy ferry dock with hundreds of people streaming off the ferryboat, while bunches of green bananas and hoards more people waiting to be loaded. 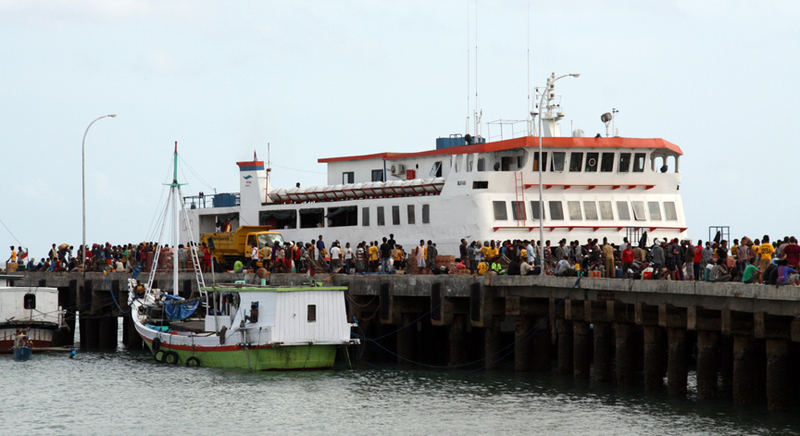 A busy ferry dock where hundreds of people loaded and unloaded themselves and their goods. The Spice Islands of Indonesia have a history of international trade that goes back thousands of years. 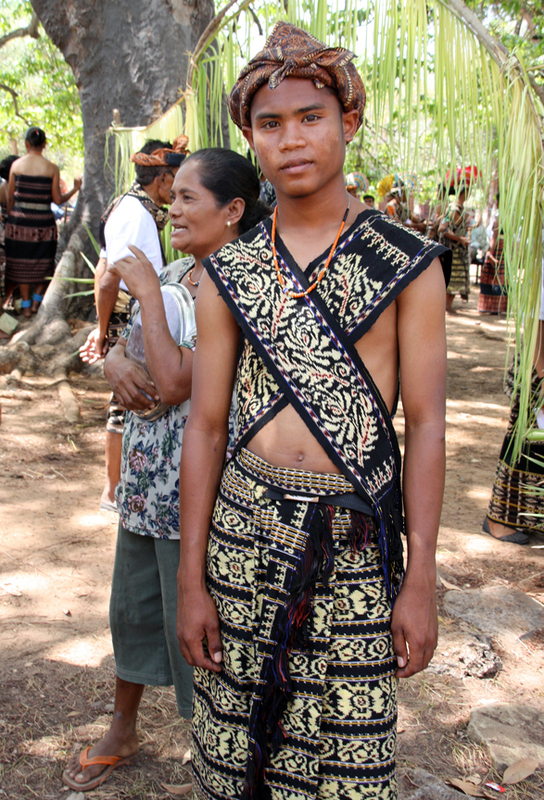 The people of Savu look Indian and they probably did come from India a long, long time ago bringing their religion, culture, and society to Indonesia – the ultimate melting pot. Today people of Savu fish and grow cashews, teak, bananas, rice, tapioca, and chilies, but here the spice trade has more or less dried up. 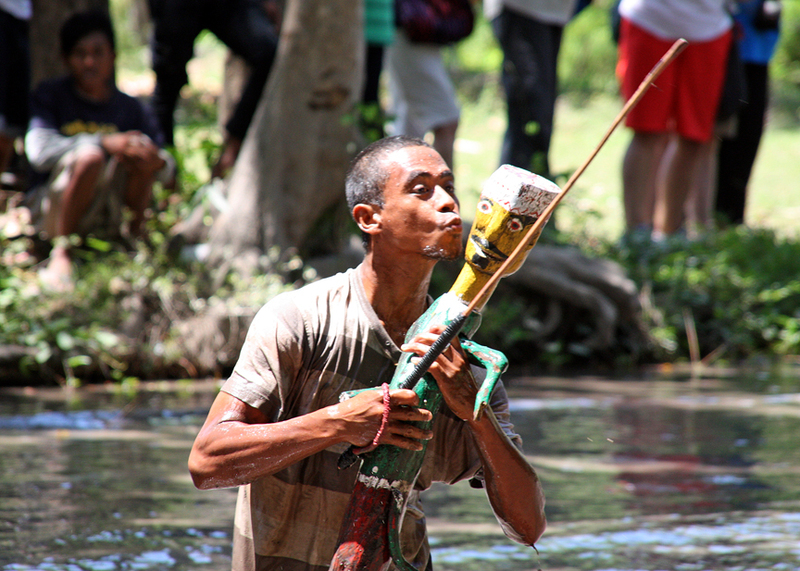 A traditional dancer from the island of Savu. Driving overland in cargo trucks to Bo’Do Village, we were met by a long line of dancers in traditional hand-woven ikats ready to perform for us. In addition to dancing, we had a chance to see a horse back riding exhibition. Savu horseback riders wearing traditional ikats on decorated ponies. The small ponies were highly decorated and trotted in quick, tight circles carrying their jockeys – young and old – who urged them on with tightly wrapped legsand rope whips. 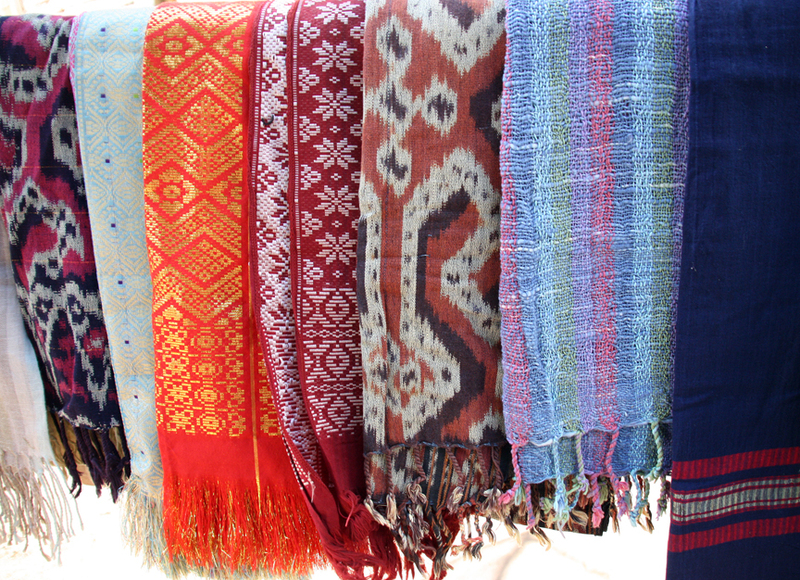 The fabric of life here is simple and complex, old and new – as it is throughout this country of contrasts that is Indonesia. Moving on to the island of Sumba with Waingapu as its regional capital, the style of traditional house changed dramatically and the landscape was suddenly peppered with impressive houses called Uma Mbatangu or “big houses” in the local dialect. The dwellings represent the layers of Sumbanese life with livestock penned at the bottom of the house and places for weaving and other activities of daily life above, while high in the rafters the objects used to connect with supernatural life are stored. 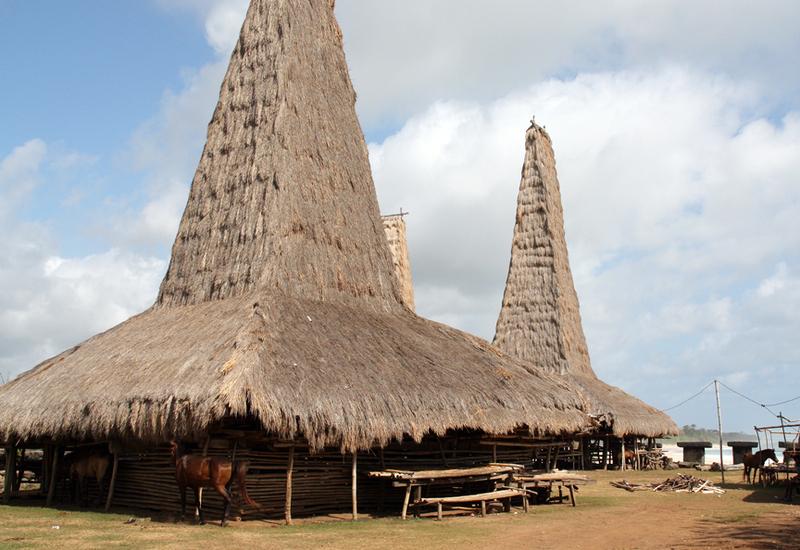 Living a layered life in Uma Mbatangu or “big houses” on Sumba Island. Komodo was another highlight of the Spice Islands journey. I am so glad I got to see the Komodo Dragons first-hand. Nothing prepared me for how big they are, how massive and stacked with muscle. Somehow graceful for all their bulk, they lumber through the park tasting the air with flicks of a forked tongue the length of my outstretched arm. We walked in groups with a ranger and guide at the front and back – these monsters are nothing to be trifled with – their venom-laden bite is also a festering spittoon of bacteria. 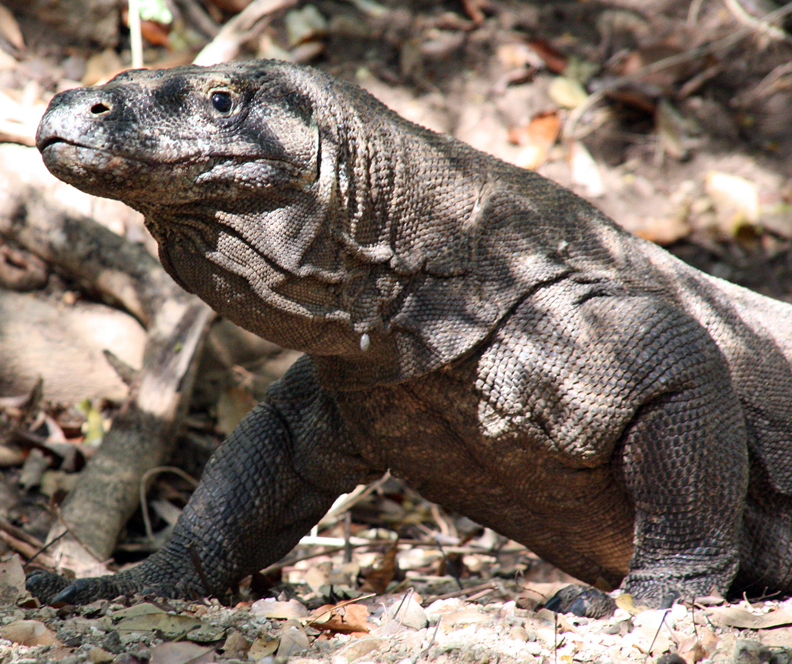 Komodo Dragons catch their prey, usually deer, by biting the animal once and then stalking it for days until the venom and bacteria poison the animal beyond the ability to escape. While we searched the tracks for signs of dragons, there were also clusters of brilliant orchids adorning the trees above, and flocks of white, noisy corellas, cooing doves, and gurgling trogons flew amongst the highest branches. 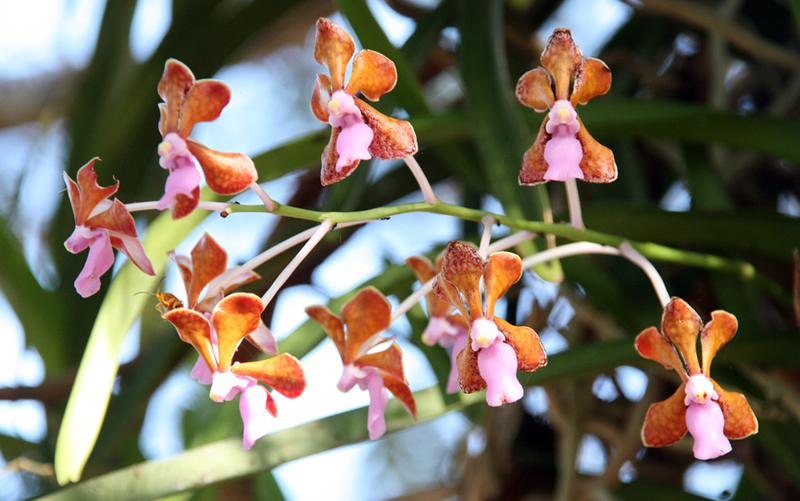 Clusters of orchids on Komodo. Sitting at the foot of one of Indonesia’s biggest volcanoes, Mount Tambora, is the small village of Kenanga. The welcome here was warm with smiling school children eager to practice their English, and dancers clothed in stunning silks and ornate makeup. 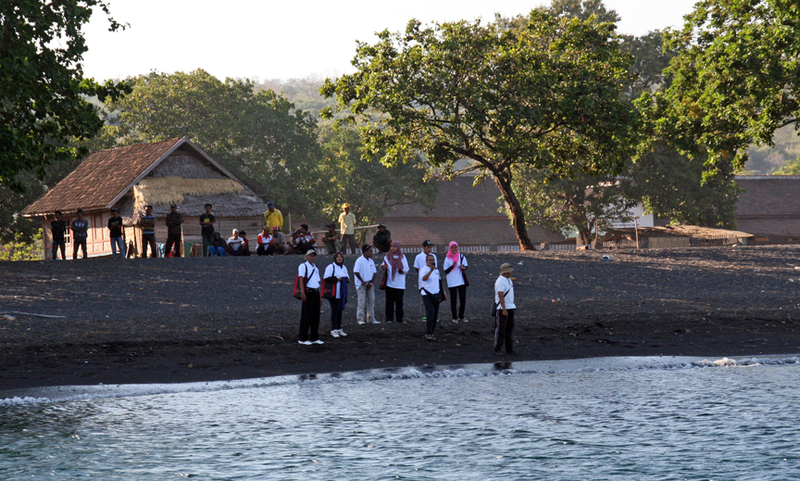 Black sand beaches and local guides greet us in Kenanga Village. School kids playing around on the beach. The villagers collect honey from the forested hillsides of the volcano or from caves that bore into the mountain. Honey and coffee are the big exports and I sampled both until I was buzzing from the sugar and caffeine combination. Back on the black-sand beach the local kids had striped down and were “helping” to push out the Zodiacs. The laughter was contagious with visitors and residents cracking up and grinning from ear to ear. Local kids help launch the boats! 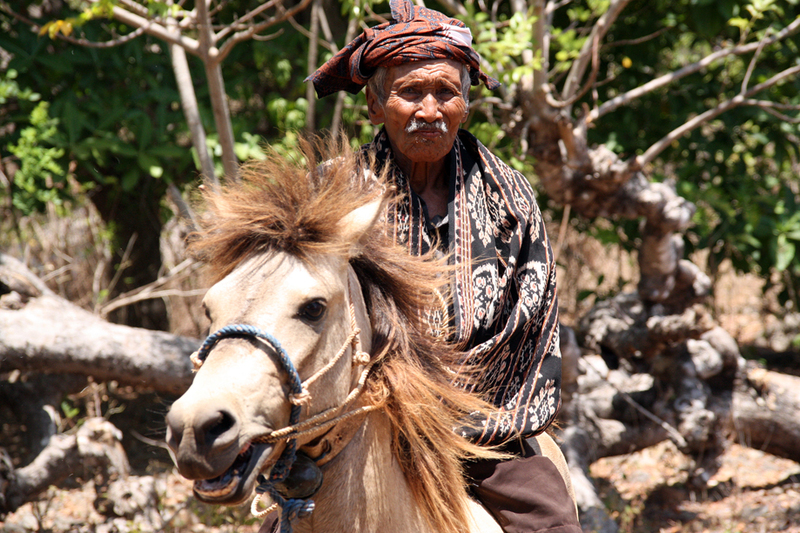 One last stop on Sumbawa,in the town of Badas, allowed another glimpse into the diverse cultures of the Spice Islands. 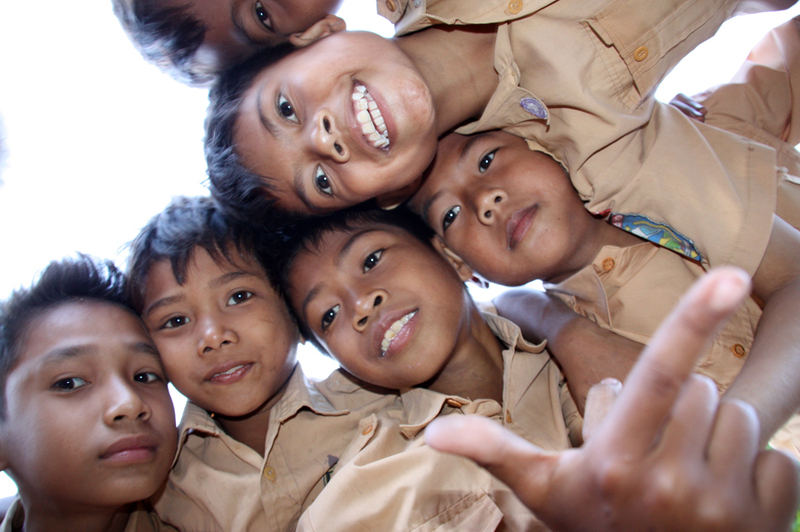 This island is known for its fantastic hand-woven fabrics, rich rice culture, and of course, buffalo racing. 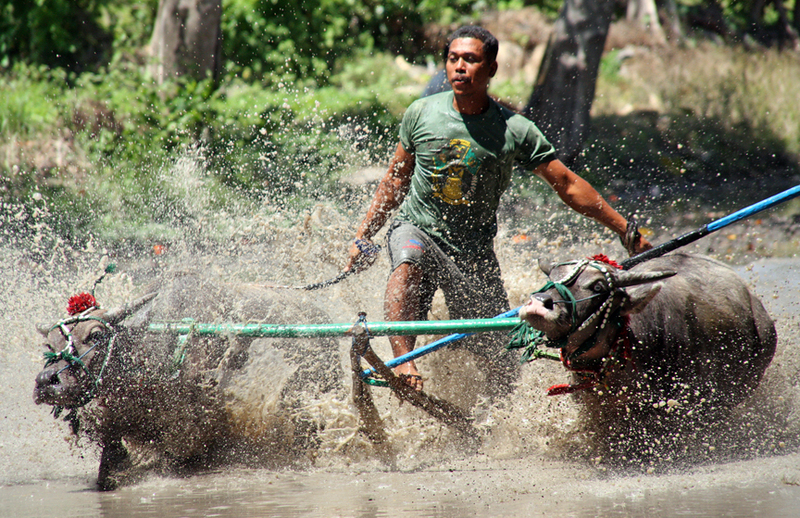 Traditionally a way to aerate the rice fields, and now a favorite exhibition for visitors, teams of two buffalo rigged together, run with a jockey standing on a sort of bamboo pole sled between the two animals. The teams run from one end of a knee-deep muddy field to the other and try to run right over a small, carved icon of a man. One of the riders actually succeeded in bowling over the statue and he grabbed it out of the water and held it high above his head before kissing it like the Stanley Cup Trophy. I feel a little bit of his same sentiment as I look back on all I’ve seen and done here in the Spice Islands. It’s a part of the world with a human history that goes back about 50,000 years to the first mariners exploring and settling the Indo-Pacific, and a place that continues to evolve into the modern age. Kissing the buffalo racing trophy. A physical and spiritual win.